Ownership / Access: Private owner. 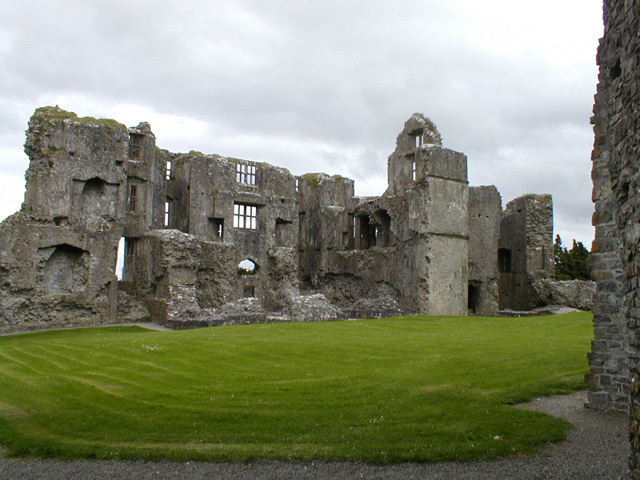 Notes: Roscommon castle is located on a hillside just outside the town. Now in ruins, the castle is quadrangular in shape, it had four corner D-shaped towers, three storeys high, and twin towers at its entrance gateway, one of which still retains its immensely sturdy vaulted roof. The entire castle was enclosed by a lofty curtain wall. It was built in 1269 by Robert de Ufford, Justiciar of Ireland, on lands he had seized from the Augustinian Priory. The castle had a most chequered history. It was besieged by Connacht King Aodh O'Connor in 1272. Eight years later it was again in the hands of an English garrison, and fully repaired. By 1340 the O'Connor's regained possession of it, and, except for a few brief intermissions, they held it for two centuries until 1569, when Sir Henry Sidney, Lord Deputy seized it. It was granted to Sir Nicholas Malbie, Elizabethan Governor of Connaught, in 1578. Two years later the interior was remodeled and large mullioned windows were inserted in the towers and curtain walls. Again, in 1641 the Parliamentarian faction gained it until Confederate Catholics under Preston captured it in 1645. It remained in Irish hands until 1652 when it was partially blown up by Cromwellian "Ironsides" under Commissary Reynolds, who had all the fortifications dismantled. It was finally burned down in 1690, and, from the closing years of the 17th-century, it gradually fell into decay. A symmetrical moat some distance from the curtain walls surrounded the entire castle and safeguarded it. It is now a national monument.